Developed by the National Strength and Conditioning Association, Essentials of Strength Training and Conditioning, Fourth Edition, is the fundamental preparation text for the CSCS exam as well as a definitive reference that strength and conditioning professionals will consult in everyday practice. Key points, chapter objectives, and learning aids including key terms and self-study questions provide a structure to help students and professionals conceptualize the information and reinforce fundamental facts. Application sidebars provide practical application of scientific concepts that can be used by strength and conditioning specialists in real-world settings, making the information immediately relatable and usable. The web resource provides students with lab activities in fillable form for practice and retention of information. Further, both students and professionals will benefit from the online videos of 21 foundational exercises that provide visual instruction and reinforce proper technique. Essentials of Strength Training and Conditioning, Fourth Edition, offers an expanded ancillary package for instructors. Instructors receive access to a 61-video collection, including the 21 videos available in the web resource, plus an additional 40 videos demonstrating resistance training exercises, plyometric exercises, and exercises using alternative modes and nontraditional implements, bringing practical content to the classroom. Working along with the instructor guide and presentation package, a test package has been added to assist instructors in evaluating students’ understanding of key concepts. 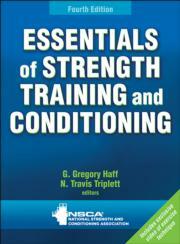 Essentials of Strength Training and Conditioning, Fourth Edition, provides the most comprehensive information on organization and administration of facilities, testing and evaluation, exercise techniques, training adaptations, program design, and structure and function of body systems. Its scope, precision, and dependability make it the essential preparation text for the CSCS exam as well as a definitive reference for strength and conditioning professionals to consult in their everyday practice. A text for those preparing for the Certified Strength and Conditioning Specialist (CSCS) examination and for upper-level undergraduates taking courses in the exercise sciences related to strength training and conditioning. Also a reference for strength and conditioning specialists, coaches, athletic trainers, physical therapists, personal trainers, and other sport science professionals. G. Gregory Haff, PhD, CSCS,*D, FNSCA, is the course coordinator for the postgraduate degree in strength and conditioning at Edith Cowan University in Joondalup, Australia. He is the president of the National Strength and Conditioning Association (NSCA) and a senior associate editor for the Journal of Strength and Conditioning Research. Dr. Haff was the United Kingdom Strength and Conditioning Association (UKSCA) Strength and Conditioning Coach of the Year for Research and Education and the 2011 NSCA William J. Kraemer Outstanding Sport Scientist award winner. He is a certified strength and conditioning specialist with distinction, a UKSCA-accredited strength and conditioning coach, and an accredited Australian Strength and Conditioning Association level 2 strength and conditioning coach. Additionally, he is a national-level weightlifting coach in the United States and Australia. He serves as a consultant for numerous sporting bodies, including teams in the Australian Football League, Australian Rugby Union, Australian Basketball Association, and National Football League. N. Travis Triplett, PhD, CSCS,*D, FNSCA, is a professor and chairperson of the department of health and exercise science at Appalachian State University in Boone, North Carolina. She has served as the secretary-treasurer of the board of directors for the National Strength and Conditioning Association (NSCA) and was the 2010 NSCA William J. Kraemer Outstanding Sport Scientist award winner. She has served on two panels for NASA, one for developing resistance exercise countermeasures to microgravity environments for the International Space Station, and was a sports physiology research assistant at the U.S. Olympic Training Center in Colorado Springs, Colorado. Dr. Triplett is currently a senior associate editor for the Journal of Strength and Conditioning Research and is a certified strength and conditioning specialist with distinction as well as a USA Weightlifting club coach. Instructor guide. Includes additional resources to aid in lecture preparation, including sample discussion questions, key terms with definitions, and chapter objectives and outlines. Instructor video. Includes the 21 resistance training videos that appear in the web resource, plus 40 videos that demonstrate various plyometric exercises and alternative modes that bring practical content to the classroom. Test package. Includes 240 multiple-choice questions. Presentation package plus image bank. Includes more than 1,300 PowerPoint slides to augment classroom discussion and lectures. Over 600 figures, tables, and images from the book are organized by chapter and can be used by instructors in handouts and classroom activities to reinforce key concepts. Student web resource with online video. Includes lab activities in fillable form and 21 video clips of resistance training exercises. These videos plus 40 more are also found in the instructor video library.